On January 19, 12 Strong – the movie based on Doug Stanton’s bestselling Horse Soldiers book – will hit theaters nationwide. The night before, the film will premiere in Stanton’s hometown of Traverse City. The film brings to life the drama of a small yet highly effective U.S. Special Forces unit deployed to Afghanistan in the aftermath of September 11, 2001. The first of two local showings will be at the State Theatre on Thursday, Jan. 18, including a Q&A featuring Stanton, retired CIA officer J.R. Seeger and others who worked on the film (this premiere showing is sold out). The next day, Jan. 19, Cherry Blossom Theater will host a special showing at 4:30pm to raise funds for Project Cherry Tree, a local non-profit that works to ensure benefits to nearly 70,000 northern Michigan veterans. A follow up event at 7pm at the Park Place Hotel will feature Stanton and others (tickets are $25; to purchase email schowen@projectcherrytree.org). The Ticker caught up with Hollywood scriptwriter and playwright Ted Tally (pictured top right), who penned the screenplay for the film. Tally, known for The Silence of the Lambs, All the Pretty Horses and Mission to Mars, says converting Stanton’s 2009 book into a movie script was a joy and a challenge. Ticker: Stanton’s book deals with much more than just the bare facts. It describes the landscape, the battles and the people. Did that make your job as scriptwriter easier? Tally: Yes, the book does lend itself to film. Doug has a vey visual way of writing. His characters are so strong. Also, the clashing and blending of cultures is rich material – 21st century warriors with all their high-tech weapons having to improvise new solution with allies that are not always completely trustworthy. Ticker: At the same time, the book has so many characters. Did that create a challenge for you? Tally: Yes. Good question. This is the only time I’ve adapted a non-fiction book. And that was part of the challenge. Real life is messy. There are dozens of speaking roles. It was a screenwriting nightmare from that standpoint. It’s hard to keep them all straight in your own mind let alone in the in the audience’s minds. In the end, you have to tell the story mostly from the perspective of three or four characters. Ticker: And how do you feel about the movie? Tally: I think it’s a great film. It has an amazing cast. There are so many wonderful, dramatic tensions. I always thought it would make a really good movie. And Danish director Nicolai Fulgsig did wonderful work. Ticker: Does a screenwriter work closely with the entire film team? Tally: Yes. Most of the time my job is intensely collaborative, especially in a movie like this. The cinematographer and the explosion guys come up with action pieces that are barely hinted at in the script. It’s an amorphous thing. It grows. Some scenes are taken out altogether. So I have to ride along with the herd and try to stay out in front of it all. 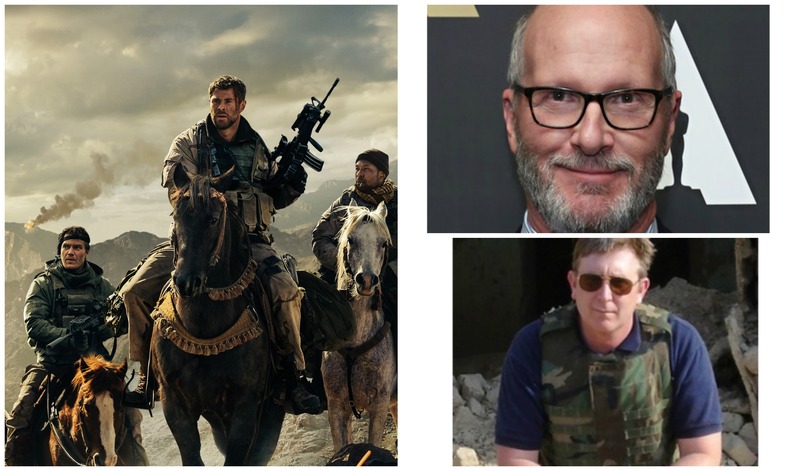 Ticker: The film rights for Horse Soldiers were purchased early on. What took so long for it to become a film? Tally: I was the first scriptwriter and probably worked on it for a year and half, maybe more. I did various sketches for [producer] Jerry Bruckheimer. Then the project sat on the shelf for years. I started to think it was becoming an old story by now. But it’s a squad moving. That makes it timeless. There’s no political agenda. Ticker: It seems that film rights are purchased on so many great books but the movie version is never made. Tally: I must have written two dozen screenplays that were never turned into movies. It’s a big frustration. It’s a lot easier and cheaper to commission a screenwriter than to take the next step and actually come up with millions to do the movie. Go into agents’ offices and you’ll see scripts stacked like cordwood.